UMBC is celebrating the Rhodes Trust’s recognition of Linda Wiratan ’19, biochemistry and molecular biology, as a Rhodes Scholar finalist. This honor comes just one year after Naomi Mburu ’18, chemical engineering, became UMBC’s first-ever Rhodes Scholar. The Rhodes Trust announced the winners on Saturday, November 17, after an intensive application and interview process. Wiratan was one of fourteen finalists in the Washington, DC district, which draws students from Maryland, Delaware, and Washington. Wiratan, who is also a Goldwater Scholar and a member of the UMBC Honors College, exemplifies these values in her roles as a researcher, student leader, and socially-conscious entrepreneur who blends science and the arts. 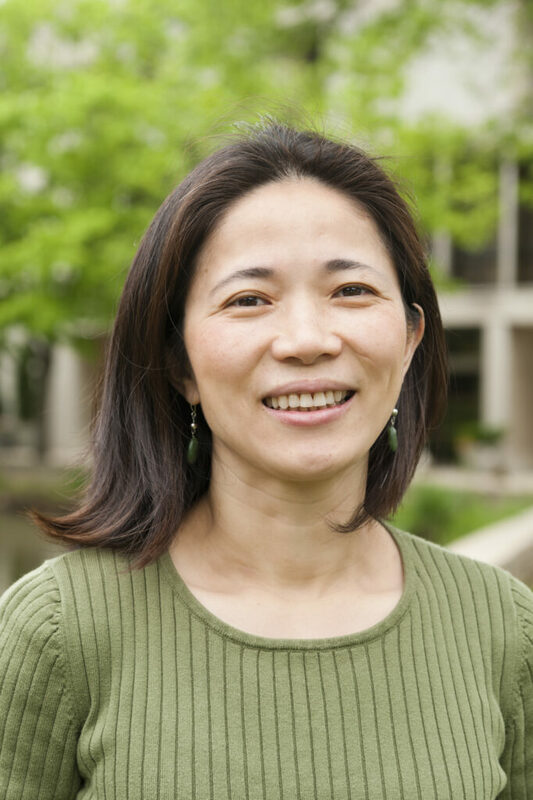 Hua Lu, professor of biological sciences, is one of Wiratan’s mentors. Wiratan began her research career as a high school student in Marcin Ptaszek’s organic chemistry lab, working closely with graduate student Nopondo Esemoto ‘12, biochemistry and molecular biology, and postdoc Joshua Akhigbe, whom she counts among her most ardent supporters and mentors. 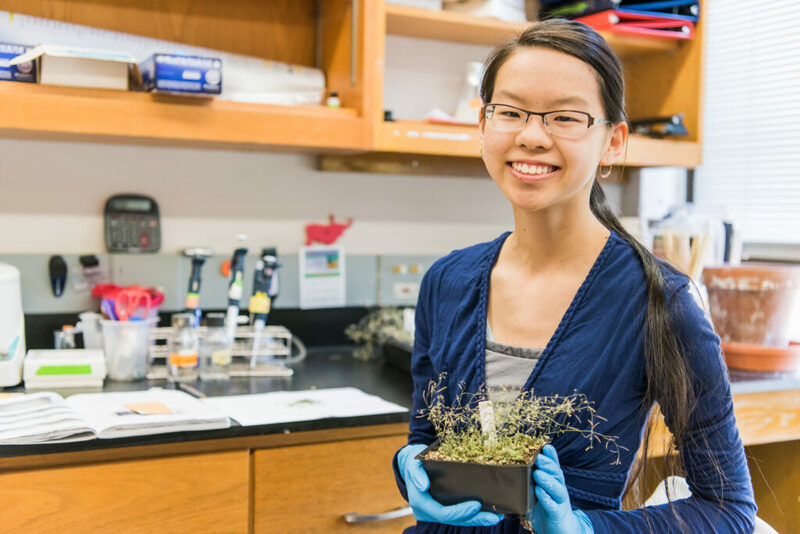 She has spent the last two years conducting research on plant immunity with Hua Lu and postdocs Chong Zhang and Min Gao, funded by two Undergraduate Research Awards. This summer she worked with molecular and cellular biology professor Craig Hunter and postdoc Andrey Shubin at Harvard University on a mammalian cell biology project. Wiratan, who also has a creative writing minor, has also written about her research for The Conversation, and been an author on four academic journal articles. Wiratan holds a firm belief that society benefits when the general public has an opportunity to better understand science. As a first-year student, she joined UMBC’s chapter of the American Chemical Society, a group with a mission to promote chemistry education and the public appreciation of chemistry. The chapter organizes outreach events with elementary and middle school students in the local community. As a senior, Wiratan now serves as its president. Through her business, City of Cells, Wiratan also blends science, the arts, and a public education mission to share her love of science with others. She produces animations to explain scientific concepts and sews toys designed to look like cells—when unzipped, the organelles come spilling out. Though still early in her scientific training and career, Wiratan has already made significant contributions to her community and to society through her scientific and creative work, and the challenges she has tackled along the way reveal her tremendous dedication, determination, and persistence. Wiratan began a struggle with severe depression as a young adult, prior to entering UMBC. Once at the university, she was focused on completing her degree, and she expected to travel an anonymous path toward that goal, but that changed when she connected with the Honors College. Simon Stacey, director of the Honors College, reached out to Wiratan during her first year, after hearing about her from an Honors College advisor. He encouraged her to stay in touch. “If I had not had that conversation in the first semester of freshman year, I would not be where I am today,” reflects Wiratan, who names Stacey among her strongest supporters and mentors. Wiratan has continued to face challenges throughout her time at UMBC, any one of which could have derailed her dreams of becoming a scientist. Throughout college, she has faced depression, social anxiety, and the increasing risk of breast cancer. Abruptly during her third year, she had to begin independently supporting herself, which came with pressure to balance spending on food, housing, education, and medical needs. And through all of these life-changing events and more, she has persevered. 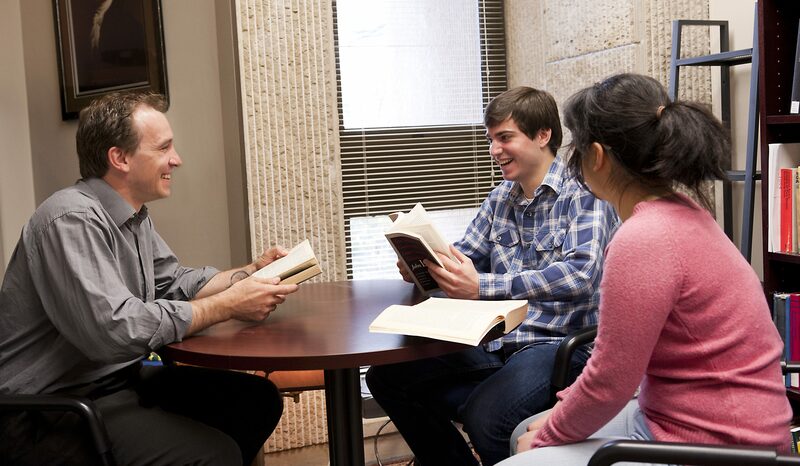 Simon Stacey (left), director of the Honors College and one of Wiratan’s mentors, meets with students. As she progresses through her emerging career in science, Wiratan also wants to bring broader awareness to the intersection of mental illness and academia, to decrease stigma and increase support for people experiencing depression, anxiety, and other challenges. As a start, she created a group on the Goldwater Scholars online forum to discuss these issues, and she intends to make this one focus of her work moving forward. She’d also like to increase an appreciation of scientists as whole people. “For people who have interests in fields other than science, such as art,” she says, “I would like science mentors not to see that as a disadvantage or a weakness or a sign of not being committed to your field.” Rather, she hopes scientists can value each other for all their contributions to the world, scientific and otherwise, and be encouraged to incorporate those other skills into their research when appropriate. “Being a Rhodes finalist tells me that I can combine all of these things—my passion for cell biology research, my interest in educating the public, and also my promotion of mental illness discussion within academia—and have a really unique, rewarding career,” Wiratan says. 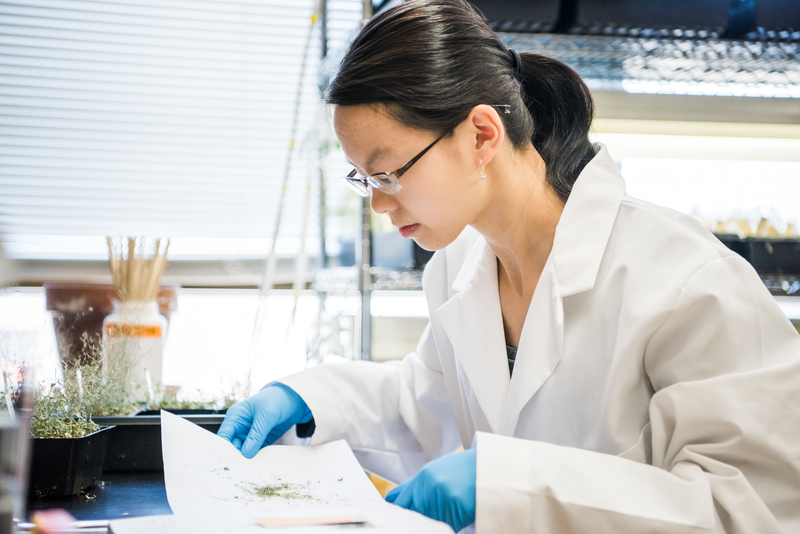 Banner images: Linda Wiratan in Hua Lu’s lab, where she works with Arabidopsis thaliana, a common model species used in plant research. All photos by Marlayna Demond ’11 for UMBC.